We created the SCLS Advocacy list as a means of communicating with library patrons and mobilizing them on behalf of their local library, and libraries across the system and state. The campaign began in November 2004, and the list now contains the names of mroe than 2,000 library supporters across the system's seven-county area (Adams, Columbia, Dane, Green, Portage, Sauk & Wood Counties). 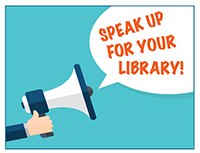 Our goal is to educate library users about the value and impact of the public library in their community, and in turn to build a base of support that can be called up when the need arises. Toward this end, we try to send list members brief emails with information about the importance and value of libraries. It might be some systemwide statistic from the annual report, or it might be a quote about libraries. These emails are important for two reasons: first, they let us educate list members about the value of libraries; and second, they let us know the condition of our list. There is nothing worse than needing patrons to reach out, only to learn that a good number of the emails are no longer valid. We believe it is important to provide people with the information they can use to start talking about the library in their community, which in turn expands the base of support. We know that libraries have direct, positive impact on the lives of patrons, and through this campaign we are turning that goodwill into action.